Don't forget to change your bookmarks and feeds! it's filled with original music that you won't find anywhere else. compliments of the S.P.A.Z. music collective. All work on this site is licensed under a Creative Commons Attribution- Noncommercial- Share Alike 3.0 License. this means, if you copy, quote, borrow, or steal anything from this site, you need to attribute it to the author. if i have not attributed it to someone else, the author is Molli Fire aka iVi. Miss iVi if yer nasty! who gwan test me COME! Welcome to the premier edition of HT-Rewind! Issue 001! Sunn O))) announced a string of West Coast US shows with the incredibly talented Wolves In The Throneroom bringing furious black metal along and Southern Lord label mates Weedeater. Sunn O))) also announced that they will play the Super Sonic Fest in UK alongside Mogwai and Miasma, as well as the Dour Festival with previous tour mates Wolf Eyes plus Merzbow and Wilco. Sunn O))) also announced that they will be releasing Oracle on vinyl. Brainwashed got a hold of the cd and has reviewed it with samplage. Exodus turns 30 this year, and to celebrate Island will be reissuing the entire album on USB stick, Micro SD, deluxe cd, cd, and vinyl. The first 3 come with video footage of Bob Marley and the Wailers performing live in London in 1977. The vinyl will be reissued as an exact replica of its first release. Dope New 50/50 Video From Wiley! Yep, all those folks are on the lineup. What isn’t obvious from the beginning of this report is that the second part features an album review by Julian Cope for one of the most amazing dark ambient metal bands – Sacrificial Totem. The album that Cope reviewed is Hurqalya which can be found on Katabatik. All fans of ambient noise, ambient metal, and atmospheric sonic storytelling should definitely check this out. Katabatik releases albums and hosts concerts with bands who create unique sonic experimentations. Their catalogue ranges from experimental electronica to IDM to ambient, metal, ragtime, and glitch-core. Definitely a fine resource of music. A limited edition red vinyl picture disc of “Rag And Bone” from the White Stripes’ upcoming Icky Thump was included in this week’s issue of NME. More info and pictures in the report. MO FIRE! MO BASS!! Bo! This mix is the shizzle! If you haven’t already, go get this mix NOW! Killer tunes, mostly original stuff and remixes from the likes of Matt Shadetek, Drop The Lime, Plastician etc. Originally mixed for BBC’s Mary Anne Hobbs show, this is the first time its been available for download, and it’s FREE! If you like what you hear, show your love and buy some vinyl and keep it spinning! Another fantastic picture book from the super talented Friedman. This report has links to where you can find other books by Friedman on Burning Flags Press. The song rules, the video rules. Go check it out. It’s about bringing our troops home to their families where they belong. Ninja Tunes found a rare master tape from 1970 of psychedelic surf rock by the Dragons. Dennis Dragon is known for his work composing soundtracks for 1970’s skate films, surf films, ski films, and more. This is such an epic story of the Dragon Brothers and how they were just too far ahead of the music business in the 70’s. If you read nothing else, read this. Okay, maybe just this, Shadetek, and Wiley. Whew! What a week! And this is just the highlights! ENJOY! OK, you all know how I feel about Earth (drone metal pioneers, and DEMI-gods! ), but Aphex Twin? He NEVER plays live shows! He is adamant about asking for so much money to play a live show that it ensures he never gets invited to play. I’ve heard that he is nothing but a jerk to work with, but that’s besides the point. This is a truly RARE opportunity to see an amazing pioneer of experimental glitch electronica! The ATP/Nightmare Before Christmas experimental music event takes place December 7, 8 & 9 at Butlins Holiday Camp at Minehead in the UK. For those not familiar, (and those in the US) think of an oversized playground with a pub on the coast with an experimental music camp out. According to the news on the Portishead site, “Signing up to the mailing list instantly makes you eligible in a draw to win a pair of tickets for ATP”. Julian Cope has a fascinating collection of music in his Album of the Month series. This month he reviewed Les Rallizes Denudés album Flightless Bird. You can stream the album while reading the review, “Facel Vega from the Heart of Darkness”. In April, Cope reviewed a truly unique album, Hurqalya by Sacrificial Totem. It is a very limited edition album released by Katabatik in Oakland, CA (only 99 copies were issued, each with hand assembled packaging). I’ve been an on again off again fan of Cope’s since I was 19, but this review makes him my journalistic mentor. I love the way some can weave a review of black metal. If you don’t recognize his name right off the bat, you may have heard him uttering chants of doom on the Sunn O))) White Album…. click to play the mix. It is a KPFA radio dj set of all Katabatik artists, the full tracklist is on Katabatik’s Sounds page. You can download the mp3 from their site. Yay! Southern Lord mates BORIS – the tiny Japanese trio with a great big GONG and a great big metal sound, will also be touring Europe this summer! Some stops will find them joining the ISIS/OXBOW concerts previously announced, one stop will find them sharing the stage with Pelican, and the others seem to be independent gigs. Southern Lord + Hydra Head = Serious Audio Doom!! BORIS page on Southern Lord as always, you can listen to Southern Lord artists on their band pages and sometimes even grab the mp3. Sunn O))) has announced more tour dates on their artist page at Southern Lord Records! I guess the Pacific Rim and Roadburn festival were good to them, because after they play the Sonar Festival in Barcelona, they will be playing one show in the UK and then heading home to the US for some west coast shows with label mates and mentors, Earth. Dang I wish I could have been at that Roadburn, but I would be happy to catch their performance in Belgium with Wolf Eyes. 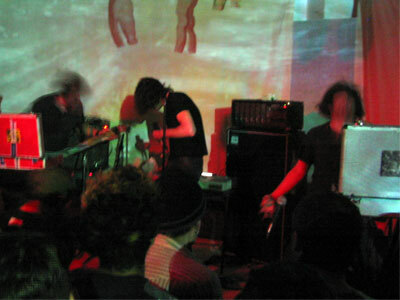 One of my very favorite Sunn O))) performances ever was with Wolf Eyes at the Lobot in Oakland. Both bands have been a huge musical influence on me. My bandmate in T113 grew up in Ann Arbor and was friends with Nate of Wolf Eyes, thus sharing some of the same musical influences and ideas. My mate first introduced me to Wolf Eyes’ brilliant chaotic noise and I was hooked. I think an ideal show for our band T113 would be with Sunn O))), Wolf Eyes and Merzbow in Japan (where they truly appreciate noise as an artform). This festival in Belgium comes awfully close! Who wants to fly T113 out to the Dour Festival to perform as well? Also on this upcoming tour, Sunn O))) will playing shows with Wolves in the Throneroom, whom I have also mentioned as a fantastic metal band. If you get the chance, definitely catch them live. They are TIGHT, and play furiously passionate metal. T113 has played shows with them, and Wolves has honored us on a few occasions by playing on our soundsystem, including at the Autonomous Mutant Festival. In fact one of my fave live performances as T113 was with Wolves in the Throneroom at Overload in Oakland. My mic wasn’t working, but my mate and I played a killer set that included a doom metal cover of Ledbelly’s “In The Pines”. The guys of Wolves in the Throneroom are such down to earth and sweet people in addition to playing stellar, dark music. Not theatrical, like Sunn O))) but intense nonetheless. The jackhammer on the A side is provided by Joe Preston (Thrones). You should be able to acquire your copy at any of the US shows. Southern Lord has not yet announced whether they will carry it in the online store, so expect a super limited edition. Ozzy’s hometown of Birmingham is about to install its own Walk Of Fame, similar to the star-lined Walk in Hollywood. And who will they honour with the very first star on this stretch of glitter and gold? Yep – Ozzy Osbourne will be inducted on the new Birmingham Walk Of Fame! Located on Broad Street, the star will be planted on July 6th, the same day that Ozzy plays his homecoming show at the National Indoor Arena. More info, including how honoured the Lord Mayor of Birmingham is to be able to offer the first star to Ozzy, can be found at NME. Crowded House – reunited and going on a world tour! On a side note, Missy Higgins‘ “On a Clear Night” debuted at No. 1 this week on the Australian Recording Industry album chart. Billboard has info on the concert’s broadcast on cable tv, radio, and webcast. And, the official Live Earth MSN website should have plenty of info as well, including how to get tickets. The 7 concerts conclude at Giants Stadium in New Jersey. i wonder if it is physically possible to see the entire concert from start to finish, or even attend all 7 in the 24 hour period? well, with the unlimited powers of the world wide web to bend time and space, we will be able to tune in to the entire 24 hours of entertainment without leaving our favorite chair…. Southbank Centre and Jarvis Cocker announced the official lineup for Jarvis’ Meltdown Festival taking place June 16-24 at Southbank Centre in London. Jarvis hand selected these bands and multi-media performers for the event. Experience the unexpected, unusual and eclectic this June in Jarvis Cocker’s Meltdown festival, where the UK pop icon curates his own eight-day festival across the venues and spaces of Southbank Centre. Armed with a sharp wit, an acid tongue and a talent for capturing the moment with razor sharp lyrics, Jarvis Cocker is one of today’s best-loved rock stars. The festival opens with sets from Motorhead and Melanie and ends with a show from Jarvis himself, taking in performances from The Jesus and Mary Chain, Iggy & The Stooges and many more along the way. If it is Jarvis himself that you are interested in, you’ll be stoked to know that he will be taking a little tour after this festival is complete. He will also be on the South Bank Show on June 10th. He will be discussing his role in Pulp, what is was like dealing with the fame, and his experiences as an “outsider” in music. The show will have video footage from his concert, and Paris where he lives and writes songs currently. For more information on the Jarvis episode, go to iTV. 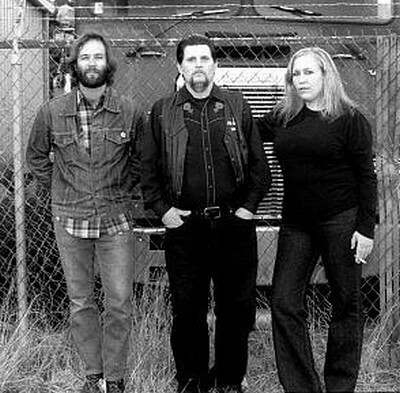 Sludge Metal professionals, Totimoshi, hail from the tuff streets of Oakland, CA, have recently released their 3rd studio album, Ladron, and have spent the last few years touring with Helmet, Melvins, Mastadon, and Fu Manchu. Today they added more dates to their 2007 US tour, so you should have ample opportunity to see their legendary live performance, even if you are in Minne, Minne! 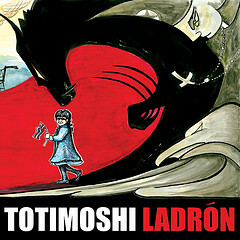 Totimoshi’s 3rd album, Ladron was produced by Page Hamilton (who also produces Helmet albums), and brings sludge metal, 70’s Sabbath style metal, and doom metal, all in one simple package. It is already available to the public, so if you like what you hear, go get it today. Oakland incubates no-frills die hard metal bands, and Totimoshi is no exception. Just off a West Coast tour w/ rock legends HELMET, Oakland, CA’s sludge-grunge-alt-hell-rock trio TOTIMOSHI are back w/ the follow-up to 2003’s “Monoli” and 2005’s re-issue of Mysterioso? to bring we mortals one of the heaviest and doom-ridden masterpieces the world of heavy rock has seen in way too long (no wonder bands like Helmet, Mastodon, Fu-Manchu, Kylesa, High on Fire, and the Melvins have tapped the band to tour and perform alongside on more than one occasion). Bringing to mind some of history’s heaviest hitters (see Blue Cheer, Tool, Nirvana, Oxbow, Helmet), “Ladron’s” sludge-heavy guitar riffs, hugely-powerful bass-lines, and pummeling drums take their listener on a pseudo-psychedelic journey through space and time, and leave them wallowing in the depths of hell. if you would like even more info about Totimoshi (like more quotes, and band bio stuff) you can find it here. Wow! it is a good time to be down under! this show not only features the notorious drone duo known as Sunn O))), but also includes a brand new collaboration with Tasmanian native – STRIBORG! This ritual will feature the first public appearance of Tasmania’s Sin Nanna aka STRIBORG, making a special & rare live collaboration with Attila Csihar, (legendary vocalist of Mayhem), Aussie avant-maverick Oren Ambarchi, and Greg Anderson & Stephen O’Malley of Sunn 0))). Blackened low-end psychedelics not for the faint hearted – a one-time event not to be missed!!! Unearthly ritual with strictly limited capacity. You can pre-purchase tickets to avoid disappointment from The Toff in Town, Metropolis Bookstore, Polyester Records and the Corner Box Office – phone: 9427 9198 or on-line: http://www.cornerhotel.com. Tickets on sale Thursday 26th April. Pre-sale tickets: + bf / on the door if available. ISIS, JESU, ZOZOBRA Bring Harmonic Tremors To SF! San Francisco is rocked by earthquakes regularly – tremors that rattle the china, or knock a picture off the wall are often shrugged off and forgotten 20 minutes later. This might explain why residents were indifferent to a bump in seismic activity last Friday when ISIS, Jesu, and Zozobra installed a wall of guitar amps that made the ground tremble. Neighbors can blame these 3 bands for the Seismic Sludge Metal rumbling from amps turned up to 5.5 (Richter). Their booking agent was wise to secure Bimbo’s 365 Club for the epic event – one of the few venues large enough, comfortable enough, and loud enough to showcase three heavyweight bands. With Jesu and ISIS, their music history alone would crush the floorboards of a lesser club. Add Zozobra to the stage, and the show would have moved to the basement. Bimbo’s delivered a solid, high quality show in style. I am super impressed by Zozobra. They could easily be headlining their own tour, but they were an ideal choice for initiating this occasion. They displayed a horde of talent and powerful command of superbly written songs. the night started with frontman and founder Caleb Scofield, appearing solo. He greeted the room with a lovely melody that he plucked from the strings of a red guitar. When he sang, it was dark, yet gentle, almost a serenade. A few moments into this ballad, the rest of the band came out and he switched the guitar for a bass. The other two guitarists flanked Scofield on stage. Both are lean, with just enough hair to cover their faces. The entire time they played, they were grinning and rocking their heads wildly. They looked very similar, almost like twins, which provided me with a stereoscopic view of iconic guitar thrashing. The three men commanded the front of the stage, headbanging powerfully and enthusiastically, occasionally synchronized by a unified strum across 17 tense strings. I felt hypnotized by the timeless guitar stances “the twins” mirrored as they sustained a restless sonic assault. Zozobra created layer after layer of harmonic tremors that rippled through the wooden dance floor, which caused the crowd to sway like skyscrapers on heaving foundations. The guitarist on Scofield’s left deftly worked a nice range of pedal effects – psychedelic tremeloes hung in the air long after the string had been silenced, a repeat/reverse combo twisted melodies into meandering snakes that doubled back over their own tracks. The guitars seamlessly complimented the rolling explosions and fierce pummelings of the drums. The ricochet of drumming resembled an avalanche with perfect rhythm, almost belying the human element at its source. Zozobra rocked so hard as an opening band, that i thought maybe they had just stolen the show! Jesu was next, led by Justin Broadrick (formerly of Napalm Death and Godflesh). Broadrick had worked out a great set for this tour : he used his laptop to integrate an occasional piano melody, or extra guitar effects, or – for one song – rapid fire kick drum action (a la Mayhem). Not at the expense of the live drummer, however, who was wicked!! He accented the machine gun rhythm with impeccably timed staccato hits on the cymbals and snare. From what i have previously read, he is Danny Walker of Intronaut, filling in for Jesu’s regular drummer, Ted Parsons. Walker plays drums in exactly my favorite style – the cymbals are used to accent and release the energy raised, rather than a constant trigger of sustained sound. I am pretty sure that he had the spring on the snare drum loose so that it did not create the typical noise, but was more like the tight marching drum once used in battle. This, sometimes combined with a rapid fire beat on the low tom at the beginning of each measure, created a feeling of heading into a tribal war. On top of everything, the guy had mad skills and his timing was flawless during the entire set. This more than compensated for the brief technical difficulties experienced by other sections of the band. Dave Cochrane, the stoic bass player, has done many collaborations with Broadrick and is covering for Jesu’s Diarmuid Dalton during this tour. Unfortunately, he encountered a series of problems with the bass amp when it began cutting out of the soundsystem. He fell off a song or two, but the interaction actually seemed to loosen him up a bit. He played more confidently and seemed to have more fun once everything was working properly. All three musicians displayed class and a good rapport, as well as technical skill. Despite this, however, i couldn’t help feel like Jesu was really just Broadrick, and the others were simply jamming along with him. Which was pretty much the case, but i didn’t want to actually feel it. Bimbo’s 365 Club is huge inside – much bigger than Slim’s, Cafe Du Nord, or Bottom of the Hill – and on this night, it was packed with metal fans. Aahhh, but the nice thing about Bimbo’s is that it maintains a comfortable environment, even when a show, like this one, is sold out. According to the club’s website, “packed” is somewhere between 6-700 people! Many decades ago, someone planned its building and interior with the definition of “ample” as their blueprint. The stage had room enough for 3 bands’ drum kits, stacks of guitar amps/cabs, 3 synthesizers on stands, and still ample room to rock. The main room is vast, with tall ceilings and plenty of ventilation. It looked like everyone in the audience had a good view of the stage, and interaction with the bands felt close and intimate. The decor is luxe and elegant, in the style of a 1940’s dinner club, and the waitresses are a bit punk rock with their black fishnets and crowd maneuvering skills. Bimbo’s 365 Club is one of the most enjoyable places in SF to see a show, especially a loud metal show. The 6-700 people in attendance comprised a good mix of metal fans – i noticed veterans as well as new faces in the crowd. 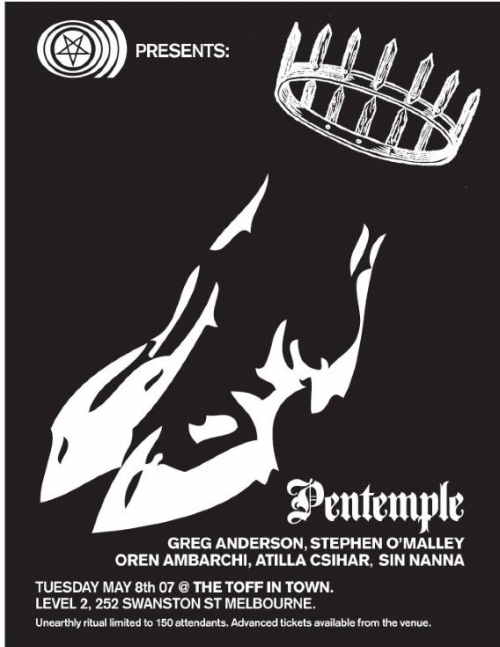 Some crews that i haven’t seen at a show in SF since the 3 Days of Darkness hosted Khanate, Thrones, and Graves At Sea, in 2004. Some of the younger faces in the crowd were likely due to Bimbo’s admittance of 18-21 year olds. Finally, after another long wait between bands, ISIS appeared. They immediately annihilated the intermission atmosphere, proving absolutely that it had been worth the 30 minute wait and the lifetime of anticipation spent by those who came to be initiated into live, loud sludge metal, exacted by masters of the craft. ISIS thrashed even harder than i have come to expect from sludge metal bands enjoying their 10th year of performing together. The 4 guitarists rejected the hypnotizing effect of synchronized movements that Zozobra had wielded, in favor of thrashing individually, each to a different aspect of the music. Sometimes bending completely over the guitar they gripped, then snapping backwards to stare at the ceiling, never relenting on the strings they were punishing. This added a striking visual dissonance that superbly matched the music’s innate discord. Sounds forged in minor keys and draped in distortion only to be fragmented by the battling pulses of the drums, the cymbals, and the synths that delayed and decayed at doomed intervals. This frenzy made it impossible to capture a clear photo of the whole band at once. You can see in my photos that some moved so quickly as to leave a trail of places they had been! B.C. Meyer (i believe) switched between atmospheric synthesizers and grinding guitar, headbanging and thrashing equally on both instruments. ISIS played a fair amount older material, from Celestial, Red Sea, and Mosquito Control, which made me VERY happy. I stopped listening to ISIS when they released Panopticon in 2004 because i prefer their earlier sound – uncompromisingly heavy atmospheric sludge metal. To my ears, Panopticon sounded too smoothed out, polished; in other words, too commercial, and devoid of the grit i felt was at the soul of earlier work. However, on stage in 2007, the occasional “weak” song merely provided enough contrast for the band to show off just how heavy their usual sound is. And heavy is something that ISIS owned at this show. They hit some songs so hard that it weighed down your own head, until you were facing your own soul, and then lifted it high with distorted upsweeps, until you gazed above the room, to where the melodies were scattering into the depths of space. At times, the pummeling beats could elevate your strong arm into the air, and cinch your hand into devil’s horns. An enthusiastic display of solidarity grew within the crowd, gaining strength with each attack on silence. I actually heard some fans singing along. Well, not really singing, more like growling. It was the first time i noticed anyone growling along to songs at a metal show. Whenever ISIS would delve into the quieter, more melodic parts, the crowd would cheer, or scream the band’s name, as if some just couldn’t handle the sudden release from crushing bar chords. The show inspired me greatly – this was the kind of show that justifies going out, and raises the excitement about what the future holds for music. The minute that i got home, i ripped the plastic off my new Celestial double vinyl to see what colours i got (the album has been repressed at least twice recently, each batch offering a different blend of marbled inks). Next, i lifted my shining black guitar from its furry grey coffin and played everything i had heard that night. That is my definition of a great show. i apologize immensely for the long delay with exciting posts this week. i wrote a rather fantastic one, from my heart – i even wrote a little blues song – detailing what was goin on here, and somehow wordpress just lost it on its way to the front page. i will try to recap here, but the song is lost for good. last week, i was uprooted from my regular routine, and delivered right into the chaotic middle of another reality. i don’t know if i aspire to spend more time in the other dimension, but i got a great glimpse into the world of book publishing when i was asked to contribute to a new project. new to me, however, the book is due to be in stores this fall! so i will be scrambling to meet sudden deadlines these next few weeks. i will do my best to ensure that the news and reviews on this site do not lag too much. i have spent way too much of my time editing this ISIS concert review, so in the future, i intend to concentrate on the writing aspect, and enlist help with editing. this new project will likely influence the direction of posts here, so you might see more dancehall, more dub, reggae, jungle, soundsystem info here. i will be concentrating on background and history, so this will be quite a diversion from news. and a welcome balance if i do say so. a concert review from the SF performance by Sonic Boom (Spectrum, Spacemen3, E.A.R.) – with 1-2 minute movies! the concert was great! i can’t wait to share the movies! i am attempting to get my own URL for this blog. i think i can continue to keep this one active, while just adding it to the new site, but i haven’t figured that out yet. we’ll see. i mainly just want more control over css and the ability to use fun flash stuff. i feel like this site lacks having access to the music itself. thanks for your patience, and for continued interest in this site! in a blatant effort to captivate your subconcious attention…. i thoroughly enjoyed the ISIS/Jesu/Zozobra concert in sf this past friday. i have some decent photos and a review that i am almost finished editing. i will be posting all of it here within the next 24 hours. i wish i could have it up already, but i’ve been swamped with projects lately. all of these posts lately have been work related for me, hence the mainstream acts getting so much attention. i will soon have more time to publish “under the radar” metal music. so stay tuned, i’m just kindling this blog fire at the moment. a google calendar keeping track of everything posted – album releases, tours, festivals, etc. HT is going to get it’s own website! i am going to move this blog over to my own url and server soon. i hope to keep this address as well, not sure how that works yet. Southern Lord Recording artists: EARTH will be performing at a special FREE in-store performance! Go check it out and dont forget to pick up the new CD/DVD/LP! this is quite a treat! i usually have to pay $20 to see these pioneers of the Drone sound. if you are in the Seattle area, don’t miss this opportunity. even if you are not sure that you like this style of music, the only way to tell is to hear it LIVE and LOUD! this latest creation, Hibernaculum, has a real traditional country twang. it’s a very unique sound, cultivated in a real roots manner. not what most people think of when someone labels it metal. three epic bands touring Europe together! each play their own unique style of metallic atmospheres. Growing plays delicate, evolving soundscapes with repeating guitar delays and minimal melodies. Thrones plays heaving metal that physically touches your skin. Wolf Eyes tortures their instruments maniacally for your enjoyment. if you haven’t heard of each of these bands, read on for your ears’ delight. GROWING will have their new record entitled VISION SWIM with them in limited tour pressing form. The pressing is limited to 100 with 6-color screened and hand assembled/glued covers by Andrew and Sara of Wacky Prints. These covers are REALLY REALLY nice looking, and were very expensive to make. One per customer at the shows please. TMU may have a few for mailorder as well. •The Whip 2001-2002 Played guitar in this band with former members of Karp. 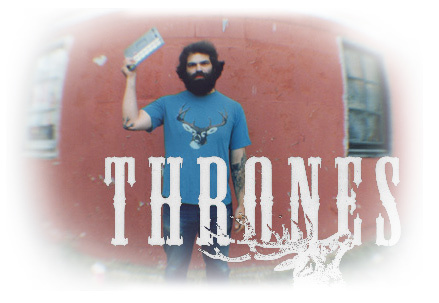 •Thrones 1996-Present Thrones is the “solo project” of Joe Preston. Thrones features all instruments. Including bass, drums, vocals and synth performed by Joe Preston. •SunnO))) 2002-2004 played on on both SunnO))) albums “White 1” and “White 2 . Played a multitude of instruments on these albums including bass, vocals and drum machine programming. Many of the tracks from “A Day Late, A Dollar Short” are taken from hard to find (ie. 7″s, cassettes, compilations, and collaborations with other bands) previous Thrones releases. The album also features some very rare and previously unreleased tracks. Beautiful packaging designed by Stephen O’ Malley, with humorous anecdotes/liner notes by the man himself. This is the first official Thrones release in five years. Day Late, Dollar Short is a fantastic collection of eccentric and inimitable songs. Thrones can sometimes teeter towards novelty but the warped humour pulls it back from the edge. I’ve always liked Preston’s work with the other bands mentioned above but this is the first time I’ve heard the man doing his own thing and it well and truly floored me. Simply put, this is a blinder of an album. Brainwashed is absolutely the most dedicated and well stocked website for authentic, quality, avant garde and extreme music. you should definitely check out how much cool FREE stuff they are sharing with anyone who wants to visit. one more thing about how cool Brainwashed is – they posted on their site an informed message urging students to ignore the RIAA !! somewhere it was alluded to that Wolf Eyes would be joining this tour for some dates, but i cannot find evidence of when that would be. so, for all practical purposes, this tour is only Growing and Thrones. you got the extra Wolf Eyes info as a bonus. Celebrating their 26th year together, the band formerly known as Dragonslayer, has finally been getting some of the recognition they deserve. They have managed to sustain a career of uncompromising controversial thrash metal in a fickle music market. In 2006, Slayer fans and SPIN readers named them “Best Live Band” in SPIN’s Readers Poll, the same year they released Christ Illusion with the single “Eyes of the Insane”. In 2007, Slayer received the Grammy Award for “Best Metal Performance.” for that single. It was their second nomination for that category, the first was in 2002, but their music finally won the title in 2007. Christ Illusion debuted at #5 on Billboard’s album chart, selling 62,000 copies in the first week. Apparently listeners made out the lyrics by its second week of distribution because it fell immediately to #44. The entire album has an overtly hard-hitting anti-government and anti-religion perspective, partially inspired by a magazine feature on US soldiers in Iraq that was published in the March 2006 issue of Texas Monthly. The article was called “Casualty Of War” and “told the story about a highly-decorated U.S. soldier in Iraq who, a mere four days away from going home, had a mental breakdown that left him “seeing faces, soldiers’ faces.” He took his own life.” That description comes from the dogmatic blog entry about the music video for “Eyes of the Insane”. More about the Grammy award winning “Eyes Of The Insane” including a listen, on Wikipedia.